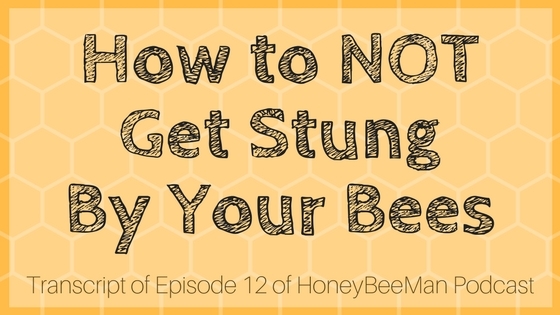 The following is a transcript of Honey Bee Man Episode 12 – All about advice on how to not get stung by your bees. Today I’m going to tell you a little bit about how to avoid an attack of honeybees or other stinging insects. First of all, let me explain that honeybees are normally very gentle. They will not normally attack people unless somebody is bothering their hive, unless they feel threatened by you getting too close to their home. If you walk up to the side of a hive and touch it, kick it, or whatever, you’re going to get attacked. They’re going to come out of there with a vengeance and they’re going to really tear you up. Hopefully, you’ll never be in this situation. However, if you ever are, I’m going to tell you about some ways that you can avoid a serious injury, which could be fatal. There are actually several fatal stinging injuries in the United States every year. This does happen, though it’s rare. I’m going to explain some ways to avoid a serious attack. Put some space between yourself and the attacking insects. If you can get indoors, that’s your best bet. Separate yourself with a screen. Just run inside a screened-in area. At least if you are in a screened-in area the only stinging insects that you have to deal with are the ones that are actually chasing you through the door. If you have 50+ bees flying around your head, if you get inside the door and only 20 of those bees make it in the door with you, then you only have 20 bees that are going to sting you unless you can kill them first. So, number one, put some distance between you and the attacking bees. Simply walk around a tree. Let’s say you have 50-100+ bees flying around your head, circling you. If there is a vehicle nearby, walk around the vehicle. This will confuse the bees. If you get out of sight of their hive by walking around the backside of a vehicle, you’re going to lose about half of the bees that are trying to chase you. If you walk around a tree, the bees will get confused by the tree. If you walk around 10 trees, walk circles around trees or walk figure-eights around different trees, this confuses the bees. You’re going to lose bees every time you walk around a tree. This should work for honeybees, hornets, any other stinging insects. It may work for some varieties better than others, but this is certainly one way that you can avoid a massive bee attack. Confuse them so that they can’t chase you, by going around objects like vehicles and trees. If you’re by a fence line, go down the fence line. If you’re out in the middle of a wide open field, that’s about the worst place you can be because there is nothing that you can do to put anything in between yourself and the bees to confuse and lose a number of those stinging insects that are chasing you. So, number two, use your surroundings to confuse the bees and lose them. Confuse and lose. Maybe most important: Try to cover your face. They’re going to go after your face. They seem to somehow know that your face, where you breathe, your eyes, where the soft tissue is. They’re going to go after soft tissue. If you have a towel or something you can wrap around your head, that’s a good thing to do because they are going to go after those tender areas and that’s really not a fun place to get stung. Hopefully, these three simple ideas can help you if you are in a situation where you are attacked by bees. Like I said, normally honeybees are very gentle and normally you wouldn’t have this problem. 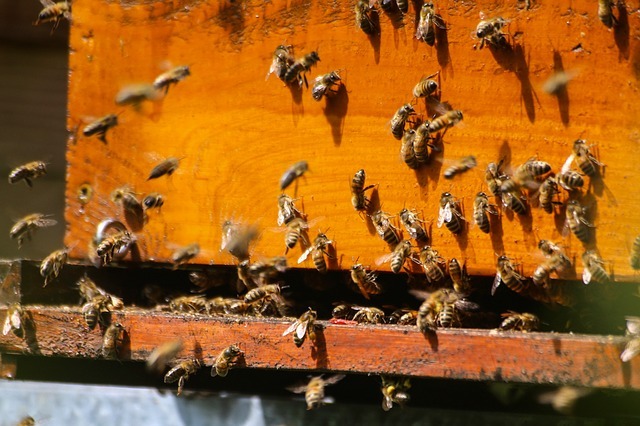 With the Africanized bees becoming more prevalent in some of the southern states, this is something that more people should be trained on, methods to get away from bees. This should work with Africanized bees just as well as it does with any stinging insect. These are just some simple methods to put some distance between you and the stinging insects. Hopefully that helps. Hopefully this quick lesson can help somebody to have a whole lot less pain.